Gasp! Shock! Horror! A well deserved award! …and a picture of a builder’s bulging bottom, I kid you not – it is an absolute delight to hear about an award that’d been given a) for something important, and b) to the person who actually deserves it. For his work making the Mars Exploration Rover mission a compelling saga for millions of people, Steven W. Squyres, the Goldwin Smith Professor of Astronomy and principal scientific investigator for the mission, has received the 2009 Carl Sagan Medal from the American Astronomical Society. 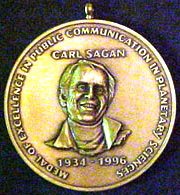 The Sagan medal recognizes a planetary scientist for excellence in public communication. Squyres will receive the medal during the AAS’s Division for Planetary Sciences annual meeting, Oct. 4-9, in Puerto Rico (http://dps.aas.org/press/). 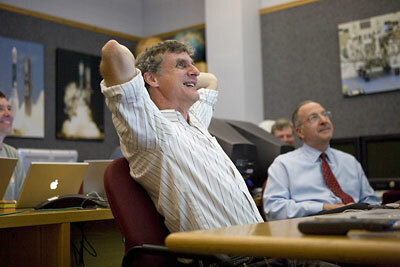 Quick to share credit with the entire Mars rover mission team at Cornell and NASA’s Jet Propulsion Laboratory, Squyres said he has always taken seriously the responsibility of giving people — the taxpayers who have bankrolled the mission — a clear window into what they are doing on Mars. “We feel very strongly that the people who pay have a real right to find out in very clear, simple terms what they’re getting for their $900 million,” Squyres said. Since January 2004, when the first rover, named Spirit, bounced down on the red planet, the Rover team has maintained a publicly accessible database of images taken by the rovers. Atypical of most NASA missions, the rover mission has allowed people to access data almost immediately. It was a conscious decision by the rover team, Squyres said, to pipeline the data straight to the Web. Squyres hopes these efforts, including a Web site that provides updates of rover activities, has inspired young people to pursue careers in science and engineering. 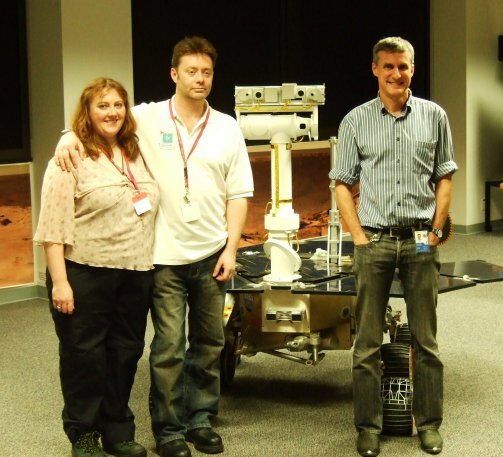 Now, anyone who has even a passing interest in Mars will know just how hard Steve Squyres has worked to make the missions of the Mars Exploration Rovers the incredible success they are. He’s dedicated more than a decade of his life to designing, building, launching and operating the twin rovers, and since they landed he has been a fantastic scientific ambassador, not just for NASA but for the world of science in general. Funny and sharp, friendly and generous, he’s an amazing person, respected and admired around the world. The main reason Steve has been given this award is for making the MER mission so media- and public-friendly. Steve personally ensured that all the images – ALL the images – taken by the rovers would be put up on the web, as soon as possible after they were received here on Earth, to allow everyone to enjoy them and participate in the mission from the comfort of their own home, school, library or workplace. Now…? Ah, now we are spoiled rotten, absolutely rotten. Now we can go online and see images taken on Mars literally a matter of hours after they were received back on Earth. Now we can browse galleries of thumbnail images, click on them and have our monitor fill with a breathtaking portrait of a martian meteorite, mountain or sunset. Now we can take those “raw” images and, using an image processing program, like Photoshop, make amazing new, original images out of them – panoramas, mosaics, colourised close-ups, all manner of wonders. For free. With the full approval of NASA. And this Brave New World all came into being because of Steve Squyres’ determination to make the MER mission open to everyone who wanted to join in. It is because of him – and, he’s quick to point out, because of the whole team he leads – that we have enjoyed stunning views from the summit of the Columbia Hills, the edge of Victoria Crater and the wide open plain of Meridiani. 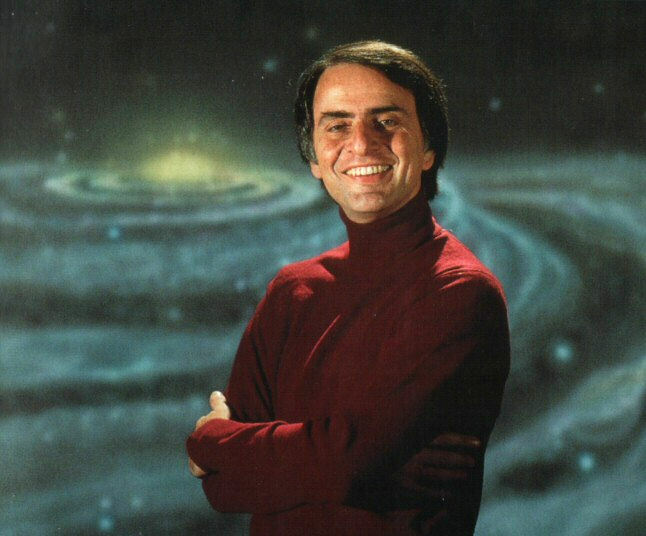 This award is given to honour the work and spirit of the late, great, and greatly-missed Carl Sagan, the scientist and broadcaster who turned a whole generation on to astronomy, space exploration and science in the late 70s with his multi award-winning series COSMOS. I was literally stunned that someone as important – and as busy! – as Steve would spare the time to talk to, well, to “someone like me”, I guess, just a space enthusiast who wanted to ask a few questions for a website. But he did, and I think that’s one of the reasons why the MER missions have been so important and life-changing for me. By having had some contact with the person behind them, the rovers seemed to take on much more significance for me. They became more than just names, and diagrams; they became part of my life. They still are, of course, as anyone who visits this blog knows all too well. And I am still a huge fan of Steve Squyres, both as a scientist and a person. He’s been good enough to say kind things about my Mars rover poems over the years, and has taken the time to answer quite a few emails too – very helpful for an Outreacher, I can tell you! I’ll admit, I was star-struck, and stood there for the first minute or so feeling like a dazed, 9 yr old girl meeting her favourite boy band popstar. But I recovered.. eventually… and enjoyed a great chat with Steve about the MERs, about UMSF and about our mutual love of Mars. 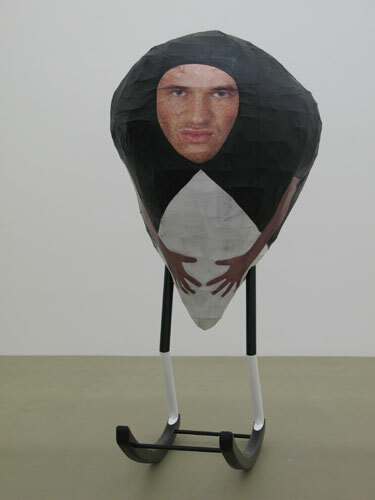 So… when I heard that Steve Squyres had been awarded this medal I was absolutely delighted. Thanks to Steve, millions of people around the world have, in a way, been able to walk across Mars, seeing for themselves its stark, beautiful landscapes, and experiencing the thrill and joy of adventure, exploration and discovery. I can’t think of anyone who deserves it more. Awesome! He deserves it too. I’ve met him a couple times myself, but not in front of a rover like you did. He is a guy that has the coolest job, and you can tell that he is very excited to tell about it, and keep telling about it – even after 2000+ sols. I just finished reading ‘Roving Mars” last week. if anyone deserves this is Steve Squires. his passion about mars and the MER Mission is contagious. he was also a major reason for rekindling my fascination with astronomy and mars. A terrific tribute to a most remarkable & influential person, Stu; well done!